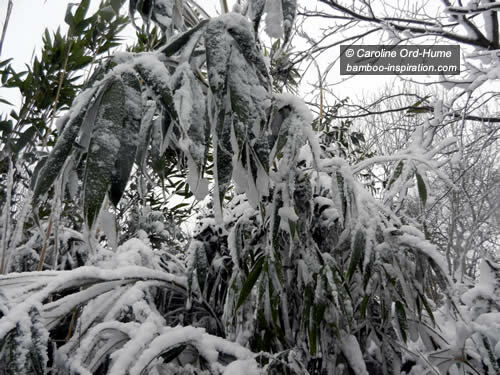 Hardy plants survive cold winter climates and bamboo is no different. Choose from the hardy species that can tolerate a range of low temperatures and freezing weather. 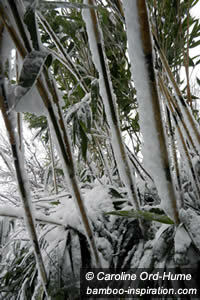 Bamboo should be sold with a detailed label that informs you of its tolerance to extreme cold. If its hardiness in winter to a minimum temperature is not on the label you must ask the nursery or supplier how hardy the species is. If they can’t tell you don’t buy it unless you are sure it will be hardy to your climate. For example, the label may state plant hardiness to -20°C but other species may indicate they will only survive in temperatures down to -5°C. There are lots to choose from but some will only tolerate mild or tropical climates; other bamboo tolerate the cold winter temperatures of more northern countries or mountain regions but only down to a certain level. I don’t think there are any bamboos that will be hardy at -40°C! 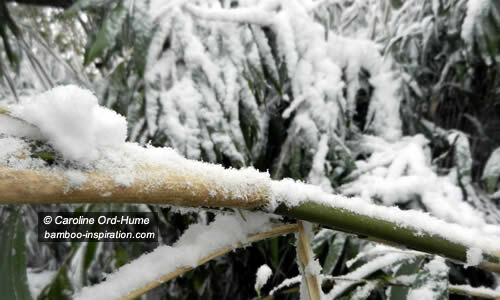 Before you even start looking for suitable bamboo check your winter climate and lowest temperatures recorded for the region. Extreme weather patterns these days mean we can’t rely on the records of lowest temperatures as meaning that it won’t go lower than that in the future. I like to stick to plants with tolerance 5 degrees higher than the lowest recorded temperatures, sometimes 10. If you have temperatures that regularly go down to -10°C there is no telling if one year that will go down to -15°C or -20°C. In that case I would get bamboo that is tolerant of cold as low as -15°C to -20°C to be sure it will survive and recover well for the next growing season. Only you can make the decision based on the climate where you are. Also bear in mind that there are differences within regions. Valleys get harder frosts, as do north facing properties, hills get colder wind, and south facing sheltered gardens are slightly warmer and protected from harsh weather. Plants in the ground can cope with lower temperatures than plants in pots. Soil in pots is going to freeze harder and faster that ground soil and therefore the roots are going to be colder and more likely to suffer in the winter. The good thing about potted plants is that they can be moved either to a sheltered position or inside a greenhouse, if you have one big enough! You can also move them into a garage, shed, outbuilding temporarily for short lived cold conditions. Just be aware that they need light so move them outdoors again as soon as the cold spell has passed. If you can’t move them to shelter, mulch the soil and/or wrap the pot, hay and straw is quite good for this but can drop seeds into the soil. If you are planting your bamboo out in the ground it will be more tolerant of low temperatures and more likely to survive harsh winters but you must plant it with enough time for its roots to become established before the cold weather starts. Plants are less likely to suffer if they have had time to establish and harden off before winter. Planting out in autumn or early winter will require protection such as a good layer of mulch. Applying heavy mulch will help protect the roots by maintaining a higher temperature in the soil that it would be if left bare. Established plants will have a layer of shed leaves on the ground underneath and those provide protection so don’t remove them. Rhizomes and roots are the most important part of bamboo. If the above ground culms and leaves get damaged by bad weather it’s not as detrimental as if the underground roots and rhizomes get damaged. Future growth comes from the rhizomes, a good thick mulch will help protection them. Placing in a position where there is some protection from the cold dry winds will help the bamboo survive through cold winters. Sometimes the effects of cold winds can be more damaging than ground frost. 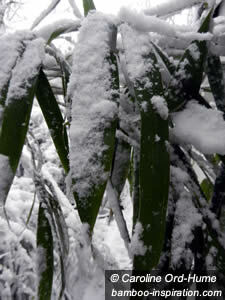 Bamboo will bend under the weight of snow and ice, even to ground level, and it will bounce back up when the snow has melted. If the snow is likely to melt within a couple of days it will be fine. 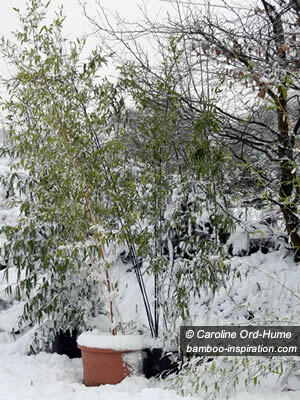 If the snow or ice looks likely to be persistent for days on end I usually shake it off gently so the bamboo stands up out of the snow and the leaves are not buried in it at ground level. Shaking off the snow is best done when it is fresh because it is hard to shift once it freezes onto the leaves; it will freeze them altogether in clumps, and will be really heavy. 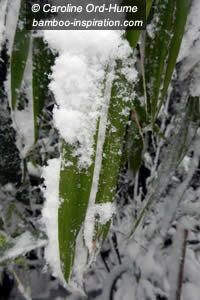 Don’t attempt to break frozen snow off the leaves because you are likely to damage them. 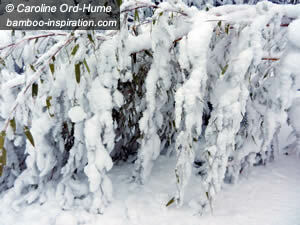 The United States Department of Agriculture (USDA) online plant hardiness map. Some hardiness maps for other countries can be found on other sites. However, I was just looking at one for the UK and it says Average Annual Minimum Temperature. Therefore, the temperatures shown do not go down as low as the lowest temperature in the winter. I would be wary of only using such maps for a guide. International weather centres are much more reliable, particlularly keeping up to date with potential issues over many years such as climate change.